Like Intel's rival Ivy Bridge release, the update includes up to four CPU (central processing unit) cores and a single GPU (graphics processing unit). AMD claims its product offers gamers a superior experience. The first computers using the chips go on sale in June, with the US launch of a Hewlett Packard "Sleekbook". AMD's focus on low power requirements reflects manufacturers' desire to offer thinner laptops and slimmer all-in-one desktop models. Trinity can be set to run off as low as 17 watts, half the minimum amount possible using Llano. The move should also allow traditional-sized laptops to run off their batteries for longer. The firm says systems could last up to 12 hours, although the figure cannot be verified until models utilising the chips are released. While Intel has shifted to a new manufacturing process - radically changing the design of its transistors - to make gains, AMD has opted for an alternative innovation. The "Piledriver" architecture of its CPU cores introduces an energy-saving technique called "resonant clock mesh technology" which allows it to "recycle" some of the energy consumed as it carries out calculations. 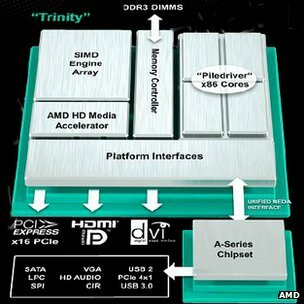 "Over the past decade, several test chips successfully demonstrated a variety of resonant clocking implementations," AMD's chief technology officer Joe Macri told the BBC. "None however, has achieved integration into a commercial processor due to various practicality or cost issues. AMD has managed to overcome these challenges. "[It] results in a reduction in total core power consumption of up to 10%." Further power savings will be achieved by running more processes on the chipset's GPU which is the same "Northern Islands" design used in its standalone Radeon graphics cards. AMD claims that the component and the accompanying software drivers are superior to the equivalent products from Intel. Third-party software including Photoshop, the media-player VLC, Adobe's Flash plug-in and many of the leading web browsers have undergone recent updates to take advantage of GPU's skill at handling "parallisable" tasks - processes that are split into different parts and then run simultaneously. This ability is also particularly suited for handling computer graphics, and AMD is keen to promote Trinity's ability to handle high definition games on systems not fitted with discrete graphics cards. "Thirty frames per second is the industry standard for smooth gaming," Sasa Markinkovic, AMD's head of desktop and software product marketing, told the BBC. "What we are able to do with Trinity is offer HD, 1080p resolution, gaming and deliver 30 frames per second. "When you look at Ivy Bridge it is a step forward for Intel in terms of graphics performance, but it's still not good enough for HD gaming - and that makes the difference between playable and not playable." Computers using Trinity will also offer AMD's "Steady Video" feature which automatically stabilises playback of shaky videos posted to sites such as YouTube; and "Quick Stream", a setting which ensures PCs prioritise streaming video when downloading several files from the internet at once. 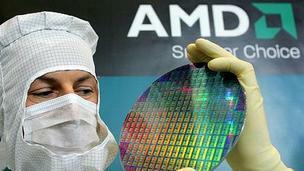 Despite its advantages, one analyst said AMD might still find itself at a disadvantage against its long-term rival. "Trinity is a compelling product from a graphics performance and power consumption perspective," said Sergis Mushell, processor expert at the tech analysis firm Gartner. "But Intel's advantage is that it has a bigger ecosystem - there will be 10 to 15 times the number of systems using its chips than AMD's. "This gives it better economies of scale and the ability to offer its chips at more price points, ultimately putting it in a strong position to challenge Trinity."